When you open the data entry form (Button #3 from the main menu) you will see the data entry ribbon bar and below a navigation area to find existing data or to create new files. Most functions are available via the Icon bar on top of this form. If the mouse pointer rests a while over one item 'tool-tip' explanations will appear, describing the function of the button. 'Table' is a toggle switch changing to 'Form' when you are in the table view. It allows switching between both data view options. The last setting will be memorized and taken as a default when you open the Data Entry Screen the next time. 'Print Screen' will directly print the current view. 'Print Screen to Mail' will open your mail application and copy a image file of the current screen as attachment. 'Import into this record' opens a drop down list with import options. You may import BDTA (text data file format, used by certain front office software such as IFA) data or XML data from the Nidek AL-Scan optical biometer. 'Export' will open the EURQUO export window. 'Show Filter' will open a filter form, allowing you to narrow down the amount of data which appears in the data entry form or table. 'Show All' will reset all filters and hide the filter form. 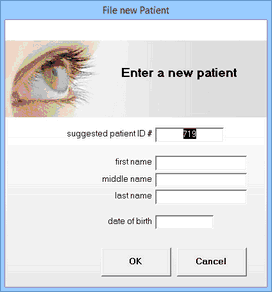 'Add New' and 'Delete' opens the create new patient dialog window or delete this treatment or patient if only one eye is left. - one of the two drop down lists next to it. The left drop down list is to select patients by their name. Typing the first few letters of the last name will narrow down the list. In case there are no entries yet in your database you will see 'add new patient' on the drop down list which starts the filing of a new patient. Browsing by patient will open the 'patient details'. You may add or edit examination data for the right and left eye individually by clicking on the OD/OS buttons. 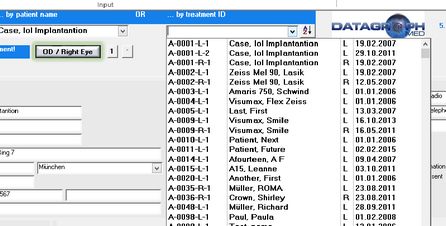 The second drop down list allows to search for individual treatments. 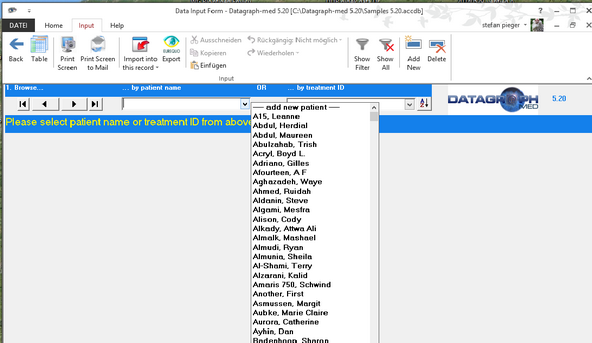 Typing in the beginning of the treatment ID number will narrow down the displayed data.